After a slow start, junior center Prince Ibeh, middle, has made his presence known with nine blocks in the past three games. Although he scored no points, grabbed just three rebounds, and was ejected in overtime, the junior center was the best player on the floor. And it was all because of his defense. In the closing seconds of regulation with the game tied, Baylor senior Kenny Chery came off a screen to a mismatch at the top of the arc. The 5-foot-11 point guard was isolated against the 6-foot-10 Ibeh. A quick move gave Chery a step or two on the towering Ibeh, and it looked like he was going to have an easy lay-up to put the Bears up. But — somehow, someway — Ibeh recovered and swatted Chery’s shot to save the game. The defensive skills Ibeh showed weren’t isolated to that moment. He’s been showing them since his emergence in Manhattan, Kansas, nearly a month ago. Until that game, Ibeh struggled to find the court. He was averaging just over eight minutes a game in the first-half of conference play after averaging over 13.5 against the Big 12 last year. On that Saturday afternoon, he got 20 minutes off the bench and forced Kansas State forward Thomas Gipson into a difficult shot to seal the all-important victory. Ibeh heeded the call. In the eight games since the game against Kansas State, Ibeh has seen his minutes increase to around 11 a game. He doesn’t light up the stat sheet; in fact, he’s only averaged 1.5 shot attempts per game in that stretch with nearly all of those coming off of alley-oops. He has more blocks in that time span (17) than shot attempts (12). Texas will need Ibeh to maintain his presence as defensive force as it hosts Kansas State at 3 p.m. Saturday in yet another game they must win as it rides that fine line that is the NCAA tournament bubble. “If we lose, we know our chances of getting in NCAA tournament are about non-existent,” senior forward Jonathan Holmes said. Senior civil engineering major Virgil Shelby rehearses his role as Pericles before the Liberal Arts Honors theater troupe, Foot in the Door, performs Shakespeare’s “Pericles: Prince of Tyre” Friday evening at the Art Building and Museum. Foot in the Door is completely student run and has put on other plays such as Alice and Wonderland and The Taming of the Shrew. Much like the play it portrays, the Liberal Arts Honors Program’s production of Shakespeare’s “Pericles, Prince of Tyre” appears to be a shipwreck at first glance. The free performance may be the victim of the unpredictable Texas weather, an unfamiliar story for audiences and the two freshman co-directors who weren’t initially familiar with the play. The performance is a comedic twist on an otherwise tragic Shakespearean play that chronicles the life of Pericles, an overdramatic prince who searches for love and encounters shipwrecks along the way. Although it isn’t Shakespeare’s best-known play, director Imogen Sealy doesn’t believe that students’ lack of familiarity negatively affected the play’s viewership. The Liberal Arts Honors Program’s Foot in the Door theater troupe will host a free outdoor preview of “Pericles” on the South Mall on Friday afternoon and an indoor performance on Saturday. Foot in the Door Theatre, which is completely student-run, performs two-to-three plays each semester and sometimes in the summer. Sealy, an ancient history and classical civilization and Plan I Honors freshman from England, said that from the start, she had a vision in her head of producing a play to be performed outside. When Foot in the Door first approached Sealy with the idea of directing a play, she accepted with the condition that her friend Kenneth Williams could co-direct, but she said she didn’t know what she was getting into. Sealy said it can be difficult to give the actors direction at times because she is a freshman, but she believes that Foot in the Door has an advantage by doing a lesser-known Shakespeare play. Virgil Shelby, an engineering senior who has the lead role of Pericles in the play, said that in the beginning, it was clear that the theater troupe had no idea what it was doing. Because “Pericles” is not as verbose as Shakespeare’s other plays and has funny undertones and quirky characters, Shelby said a lot of people could use the show as a stepping-stone to get interested in Shakespeare. Linda Mayhew, advising coordinator for the Liberal Arts Honors and Humanities programs, said that because of the editing of the directors, the play is accessible, so someone unfamiliar with the work can follow along easily and catch all of the jokes. “‘Pericles’ is fantastic — it’s funny, quick-paced and filled with Shakespearean angst of lovers lost and reunited,” Mayhew said. Shelby said he likes his role because Pericles is a “total imbecile” and an “absolute dork” who has no idea what he’s doing, apart from being melodramatic. For better understanding, Shelby recommends that viewers concentrate on the actors’ actions rather than their words because some characters will be developed more with their attitudes than with their dialogue. At the very least, Shelby believes the play is a good excuse to take someone on a date, but he hopes that viewers will leave the performance “amused but confused.” To those who don’t understand Shakespeare’s language, Shelby has a confession. The story of a teacher (Lindsay Burdge) carrying on an affair with one of her students could be brainless titillation, but “A Teacher” director Hannah Fidell brings astounding focus to what proves to be a fascinating but ultimately unrewarding film. Burge gives a powerhouse performance as the titular rulebreaker, and watching her dig her own grave and love every minute of it is a riveting train wreck in slow motion. Fiddell directs with remarkable economy, and the film’s percussive score is jarring but magnetic, but “A Teacher” continues an unfortunate trend in independent cinema of ending just as its central conflict kicks into high gear, resulting in a film that’s gripping when it wants to be but narratively unfulfilling. “A Teacher” screens again Sunday 3/10 at 9:30 and Thursday 3/14 at 11:15. “The Bounceback” posits itself as a romantic comedy about Stan’s (Michael Stahl-David) quest to win back ex-girlfriend Cathy (Ashley Bell) over one weekend in Austin, Texas, but the film is really a love letter to our fair city. Austin locales feature in almost every scene, with major sequences of the film taking place in the Alamo Drafthouse and various 6th Street bars, all of them lovingly brought to the screen. Writer/director Bryan Poyser has made “The Bounceback” slippery by design, and the film dances around paying off its premise for much of its runtime, ultimately becoming something very different than you might expect from the tagline. It’s an surprisingly mature film, boasting a hilariously committed performance from Sara Paxton, and a low-stakes greatest hits tour of Austin TX. “The Bounceback” screens again Sunday 3/10 at 9:45, Friday 3/15 at 9:15, and Saturday 3/16 at 4:00. When he’s not making irreverent studio comedies, David Gordon Green brings a certain poetry to his work, and his tale of two road crew workers, Alvin (Paul Rudd) and his girlfriend’s brother Lance (Emile Hirsch), is Green at his most elegant and relaxed. “Prince Avalanche” is a gentle, contented comedy, full of observant writing, and Hirsch and Rudd give a lovely duet of performances. Rudd is uncharacteristically restrained here, but as unabashedly likable as ever, and Hirsch is hilariously dense as the city boy itching to get out of the Bastrop backroads. The intimacy that builds between the pair by the end of the film feels earned, and David Gordon Green’s emphatic, languid film explores isolation and loneliness touchingly. “Prince Avalanche” screens again Thursday 3/14 at 9:00. Neil LaBute, adapting from his own play, writes “Some Girl(s)” with his wit at its sharpest and his radar for exposing the ugliest of human behaviors at its most alert. Adam Brody stars as a nameless man who jets around the country during the planning of his wedding, reconnecting and clearing the air with a variety pack of ex-girlfriends. Each conversation pulls back another layer of Brody’s psyche, and these women hold a mirror up to him with their own picture of what he is, each of them slowly filling in a blank until we fully understand his character. It’s subtle, intelligent writing, starkly directed by Daisy von Scherler Mayer, and greatly realized by the film’s ensemble. From Kristen Bell’s sharp wit to Zoe Kazan’s adorable fragility to Emily Watson’s weathered bitterness to Adam Brody’s unshakable charm, “Some Girl(s)” is a spectacularly acted exploration of fidelity, memory, and forgiveness. “Some Girl(s)” screens again Monday 3/11 at 9:15, Tuesday 3/12 at 9:30, and Friday 3/15 at 1:30. The rare anti-romantic comedy, “I Give it a Year” is an interesting, subversive film that depicts the standard courtship in reverse. As the film begins, Nat (Rose Byrne) and Josh (Rafe Spall) get married, and over the course of their first year together, the soft edges of their relationship begin to harden and chafe, making them both increasingly unhappy. While the idea of a marriage dissolution comedy is a strong one, “I Give it a Year” suffers from some debilitating problems. Namely, it’s near impossible to root for two characters that are slowly but surely poisoning a life they’ve attempted to build together, and since the film never gives us a look into their courtship, there’s nothing to invest in here. “I Give it a Year” has a very British sensibility, and the film’s sharp, witty script is full of hilarious payoffs and clever moments, but the work as a whole is caustic, without a human moment to be found. It’s easy to laugh at these characters, but very rarely are we laughing with them, or for them. “I Give it a Year” screens again Sunday 3/10 at 4:30, Tuesday 3/12 at 4:30, and Wednesday 3/13 at 4:15. In its early going, “Haunter” seems like “Groundhog Day” filtered through teen angst, but once Lisa (Abigail Breslin) realizes that she’s trapped on the eve of her 16th birthday because she and her family are dead, the film starts to pick up. Vincenzo Natali brought a magnetically twisted perspective to “Splice,” his last film, and “Haunter” is magnificently creepy, tackling chilling material with enthusiasm. Abigail Breslin has the entire film on her shoulders, anchoring every scene, and she displays an emotional rawness and force of will that I haven’t seen from her before. It’s a strong performance from a young actress still coming into her own, and promises more great things from Breslin in the future. While “Haunter’s” logic can sometimes get a bit muddled, the film never loses sight of its emotional core, the story of a girl forever trapped as a 15-year-old, which may be a fate worse than death. “Haunter” screens again Wednesday 3/13 at 11:45 PM. Freshman point guard Jevan Felx had eight turnovers adding to the Longhorns 26, the highest total in the Rick Barnes era. Why Texas won: Texas didn’t waste any time pulling away from Coppin State. The Longhorns squeaked past a Fresno State team that won only 13 games last year, 55-53, in their season opener last Friday, never leading by more than five points. Despite committing 26 turnovers and shooting 55 percent from the free throw line, they won by 23 points Monday. First half: Sheldon McClellan, who scored a game-high 20 points in Texas’ season-opening win over Fresno State last week, picked up right where he left off. He had 13 points by halftime while Texas’ defense held Coppin State to 21.4 percent shooting from the floor. After recording just three assists in the win over the Bulldogs a few days earlier, Texas had nine in the first half. Freshman point guard Javan Felix, starting his second straight game in place of Myck Kabongo, who continues to be investigated by NCAA, had six of them. Second half: Texas got off to a sluggish start after halftime, hitting just one of five shots and committing five turnovers in the first 4:45 of the second half. But a three-pointer from McClellan, sandwiched between a pair of dunks by Prince Ibeh, one on the back end of an alley-oop from McClellan, got the Longhorns back on track. Texas shot 54.5 percent from the floor in the final 20 minutes after shooting 40.7 percent in the first half. 24.6: Coppin State’s field goal percentage. After holding Fresno State to 35.6 percent shooting last week, the Longhorns’ defense stepped up again, holding the Eagles to 24.6 percent shooting from the floor and out-rebounding them, 50-25. Up - Sheldon McClellan: The sophomore guard struggled with his shot Friday, scoring 14 of his 20 points from the free throw line. He was much more efficient Monday, going 7-for-10 from the floor and connecting on three of four three-point attempts on his way to scoring a career-high 25 points. Down - Prince Ibeh’s free throw shooting: The 6-foot-10 freshman was solid Monday, grabbing nine rebounds in 20 minutes. His free throw shooting wasn’t. He went 0-for-4 from the charity stripe and missed the rim on a pair of free throw tries in the second half. Texas gets a week off before next Monday’s game against Chaminade in Hawaii, its first in the Championship Round of the Maui Invitational. The Longhorns will face either Southern California or Illinois in Tuesday’s semifinals. Texas made its last Maui Invitational appearance in 2008, when it finished in third place. In their only meeting, the Longhorns beat Chaminade, 84-62, in 2004. 1. Cincinnatti Reds: The Cincinnati Reds become the favorites in this division purely based off subtractions from other teams. Albert Pujols is no longer a Cardinal, and Prince Fielder is no longer a Brewer. The Reds did make a big trade in the offseason to acquire front line starter Mat Latos from the Padres, and he will join Johnny Cueto at the top of the rotation. Joey Votto and Brandon Phillips will bring the offense, and the Reds are sitting pretty before the season gets under way. 2. St. Louis Cardinals: The World Series champions have had a bit of retooling to do since they were spraying champagne in October. Albert Pujols took his talents to Los Angeles, and that leaves a big gap in the lineup for Matt Holliday and Lance Berkman to fill. Hall of Fame head coach Tony LaRussa retired, meaning they will have a new manager on the top step for the first time in 16 season. It’s not all doom and gloom in St. Louis though, they do get Adam Wainright back into their rotation, who missed all of last year with Tommy John surgery. Along with the strength of the rest of the rotation, the Cardinals will once again be competitive. 3. Milwaukee Brewers: Like their divisional counterpart Cardinals, the Brew Crew has a bit of rebuilding to do as well. Prince Fielder left for big money over the winter, and his left handed bat will be sorely missed. They added former Cubs third basemen Aramis Ramirez to the squad, and they do still have the reigning NL MVP in Ryan Braun. With the rotation headlined by Zach Greinke, the Brewers should make noise again in 2012. 4. Pittsburgh Pirates: With the Pirates on the cusp of their 20th consecutive losing season, there seems to be at least a small, minute gleam at the end of the tunnel. The Pirates were the surprise of the National League last year when they managed to stay relevant until August before unraveling at the seams. They locked up Andrew McCutchen to a long term deal and add A.J. Burnett to their rotation, but just crossing the .500 mark for this team would be cause for a parade in the steal city. 5. Chicago Cubs: The Steve Bartman incident of 2003, along with the last century of torture from the baseball gods, continues to burn holes in the souls of Cubs fans everywhere. The good news on the north side is that they took a step in the right direction this winter, trading for Red Sox GM Theo Epstein, who knows a thing or two about killing legendary curses. The bad news is, it takes time to build a team from the ground up, and the Cubs are in year 1 of a multi-year process. Patience Cubs fans, nothing lasts forever. 6. Houston Astros: They finished with the worst record in all of baseball last season, and appear to be spiraling into another failure of a season in 2012. They do have a new owner, Jim Crane, who promises to pump money and provide resources to turn the team around, but it’s not in the foreseeable future. The Astros have a farm system ranked in the bottom half of the entire league and average to below-average baseball appears to be on the horizon for awhile. The good news? They’re doing baseball a favor and bringing back the awesome Colt .45 jerseys that they wore for their first three years of existence. Editor's Note: This is the first in a series of interviews with some guests who will be appearing at this weekend's STAPLE! Convention at the Marchesa Hall and Theatre. The Page will have a table there, with all your favorite artists here at DT Comics. Comment on this article to enter in a drawing for one of five Weekend Passes we're giving away. Liz Prince is a cartoonist from Boston whose 2005 book, "Will You Still Love Me if I Wet the Bed," was published by Top Shelf and won her an Ignatz Award for Outstanding Debut. 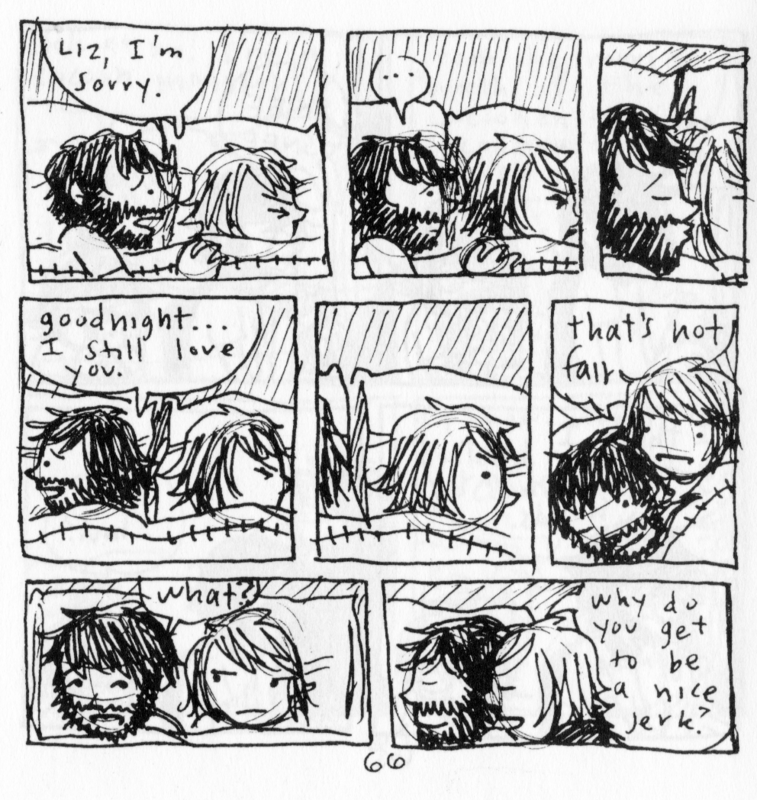 Liz draws short, autobiographical comics that give their readers a very relatable glimpse into the most personal aspects of Liz's life. I had a chance to ask Liz a few questions. DT Comics: For your book Would You Still Love Me if I Wet the Bed, is any importance placed on the order of your strips? Would you prefer the reader to look at the content of the book as a whole or to look at it as a collection of individual comics? Liz Prince: I view Will You Still Love Me If I Wet the Bed? as a collection of individual comics, that as a whole paint a larger picture of a relationship, but I prefer that the reader put their own experience into it. Since it's so personal, but also relatable, I get a lot of mail from people accusing me of spying on their relationship, and exclaiming that they thought they were the only ones who were so silly and gross. I feel like it acts as collection, like Garfield or Calvin & Hobbes collections: the strips can be read individually, but when read together you become immersed in their world. DTC: What are the strengths of the style of your art, which as I see it, is a more improvisatory, spur of the moment sort of thing, to telling the types of stories you want to tell? LP: Again, I'd say that my art style makes my comics more relatable to my audience: you really nailed it when you called it "improvisatory". Definitely the comics that make up the Will You Still Love Me and Delayed Replays books are strictly improvisational: those were drawn in a sketchbook, straight pen on paper, with no planning or laying out. To me those are very bare-bone diary comics: things that I just wanted to get out onto the page. With my more recent online comics, and the pages I draw for Razorcake, If You Make It, and assorted anthologies, those are more traditionally laid out beforehand, and then penciled and inked. My first foray into actually writing and scripting a story before drawing it has been my series I Swallowed the Key To My Heart. They have a more finished feel, but I believe that the spirit of "spur of the moment" idea still exists. DTC: You seem to have a fairly close relationship with Jeffery Brown, but I've heard you say you are not involved with the Boston zine scene. Is having a community of other artists important to you? LP: I don't know that I would say I have a "close relationship" with Jeffrey, we're definitely friends, and he drew me in a recent comic strip for the magazine Devastator, which I was so incredibly honored by. He was a big supporter of my work when I first started showing the comics that would eventually become Will You Still Love Me... to people. Having a community of artists is incredibly important to me, and I have many close friends who draw comics, and who I collaborate with from time to time, most notably my downstairs neighbors Maris Wicks and Joe Quinones, who are both working comics artist for First Second and DC/Marvel/Dark Horse respectively. I think you might be referring to when I said that I wasn't active in things like the Boston Comics Roundtable, which is a group of artists and writers that get together and share their projects to get feedback. I'm a little precious when it comes to my work, especially the I Swallowed the Key To My Heart books, because they're all autobio stories, and I'm less comfortable with having people making story suggestions (not that I couldn't benefit from some guidance that way). DTC: Do you ever see yourself straying from these more autobiographical comics? Are there any other forms of narrative that interest you? LP: I think that my main workflow will always be autobio, although more recently with things like the Alone Forever comics I've been drawing, they're becoming more and more peppered with parody. I have always dreamed of doing a story for the Simpsons Treehouse of Horror issues that come out every year for Halloween, and I want to get my foot in the door to draw Adventure Time comics. I don't know that other forms of narrative interest me in a storytelling way, but I am working on illustrations for a children's book and doing a lot of design work for punk bands, which are both big interests of mine. Liz Prince will be appearing at the independent media expo STAPLE! March 3rd and 4th at the Marchesa Hall and Theatre in Austin, TX. Indie rock group Maps and Atlases gets funked-up for their latest release, Beware and Be Grateful. Channeling artists like Prince, the band explores a more electronic sound, while maintaining their definitive sound. (Photo courtesy of Big Hassle Publicity). “We have been listening to a lot of Prince over the years, so it’s definitely an influence on this record,” said Maps and Atlases guitarist Erin Elders of the group’s latest album, Beware and Be Grateful in an interview with The Daily Texan during this year’s South By Southwest. In renovating their sound by following a more new-wave, ’80s funk direction, the band takes a new and unpredictable approach on their second full-length album. The influence seems unlikely — Maps and Atlases, who have often been praised by critics and fans alike for their odd time signatures and intricate dueling guitar parts (a genre more commonly known as math-rock), don’t come off as Prince fans upon listening through their discography. Until now, that is. Beware and Be Grateful is Maps and Atlases’ funky road less traveled. Take album-opener “Old and Gray” for example. Reminiscent of Prince’s 1999, “Old and Gray” moves creepily with moody chords that grow with layered vocals from frontman Dave Davidson. Strangely, it works. Davidson imitates Prince’s falsetto-to-low-mumble singing technique precisely, but primarily relies on his own mountain-man nasal drawl to retain that definitive Maps and Atlases sound. Songs like “Old and Gray” and “Remote and Dark Years” shine because of Davidson’s funk-laced vocal delivery. On the latter song, the vocalist may be at his best. It’s not necessarily the lyrics that make “Remote and Dark Years” so great, but rather the way he says a certain word. How he repeats “I” in the chorus, which receives the shrill and desperate reply “Don’t want anymore,” paints a tale of absolute sorrow. It’s like Cyndi Lauper’s “Time After Time” — you can’t help but want to slow-dance and cry at the same time. It’s kind of a 1980s dance party with Maps and Atlases on this album, but they still retain what makes them Maps and Atlases. “Be Three Years Old” has that Peter Gabriel tribal guitar that encompassed much of Maps and Atlases 2010 LP, Perch Patchwork, while “Bugs” has the folksy, finger-tapped/picked electric guitar technique that has been a staple of the band’s sound since their inception. Unlike past releases though, the guitar is secondary. The band has incorporated new instruments and other sounds, using the guitar to emphasize a certain melody or progression in the song. Although you won’t be seeing Maps and Atlases bringing Purple Rain-era neon suits, heels and makeup back (although Davidson’s beard with a touch of neon blue might be great to see), it’s impressive that the band takes inspiration from such unforeseen sources on Beware and Be Grateful, all while maintaining the creativity and energy that has made them so great in the first place. Indie rock group Dale Earnhardt Jr. Jr. glide gracefully to the finish line like the race-car driver they take their name from. In their melodies you can hear the jubilant atmosphere of The Beach Boys, accompanied by electronic percussion that would make late producer J Dilla proud. Just one listen to their song "Nothing But Our Love," and you'll hear the two-piece's (three-piece live) knack for creating dazzling arrangements, all centered around a focal narrative. The group is scheduled to play the Warner Sound Showcase Wednesday, featuring Kimbra Gary Clark Jr. Daniel Zott, multi-instrumentalist and co-vocalist for Dale Earnhardt Jr. Jr., spoke with The Daily Texan about karaoke, songwriting and touring experiences. Photo cap: Indie rock trio Dale Earnhardt Jr. Jr. will be performing at La Zona Rosa tomorrow for their Warner Sound Showcase. Photo by Jeff Snow. The Daily Texan: You guys recently finished up a tour with Fitz and the Tantrums, correct? Daniel Zott: Yeah. We had a January tour with them up in the west coast. DT: How was it touring with them? Any memorable experiences? Zott: It was great. It was great playing to a different crowd, rather than returning home and playing to the same people. They're [Fitz and the Tantrums] are a little bit older, so the crowd was a little bit older. But it was cool playing to people who may have never heard of us before. It was a good time on that trip; we had a lot of fun doing karaoke, and had some of our own headlining shows in LA, and a performance on the Conan show. DT: Any notable performances during karaoke? Zott: I'm really good at doing Creed, or anything that has the Pearl Jam-y, Creed voice. I was bringing the house down, but then I got trumped by this random dude wearing a suit and trench coat, who dropped Prince on everybody. It was unbelievable; that was the highlight of the night. DT: You guys are also scheduled to do this year's Bonnaroo. How does it feel to be a part of such a festival, and who do you hope to see? Zott: It feels great. Whenever you're on the same bill with groups you respect, it's just really exciting. We did Austin City Limits last year, and it was so much fun. Now that I know what it's like I always look forward to playing festivals, and playing in front of really large crowds. I imagine Bonnaroo will be pretty hot; I'm thinking of getting a dunk tank and allowing fans to dunk us in the middle of our set. DT: That would probably be the greatest onstage prop ever. Zott: (Laughs) It would be awesome. DT: You guys recently had a competition where fans remixed your song "Simple Girl." How did you guys go about choosing your winner? Zott: Well, Josh and I sat down one day and listened to all of the remixes we received and just rolled through it. We narrowed it down from 72, to our top ten picks, and made a decision on just one of them. The reason why, I think, we picked the PETA Chip one is because, it kept the melodic nature of the song, but also created its own melody. It was really fun to see people mix the song, and hear what they would do when given the opportunity to make something new. DT: You recently tweeted about how all of Notorious B.I.G. 's records with all of the Puff Daddy filler needs to be muted out. I found that super funny. What other hip hop groups are you into, and have you ever slow danced to "Big Poppa?" Zott: Of course, man. (Laughs) Although it's not my favorite, there's this cheesy movie with Keanu Reeves Where he teaches kids how to play baseball [Hardball]. In the movie the pitcher can't pitch well, and when he does it's because he has "Big Poppa" playing in his headphones. I love that movie, it's so sad, but it's so amazing to me. As for other rap I listen to all sorts of it; Kanye West had the largest effect on me. When I was in high school I heard "Through the Wire," and it was just really inspiring. I went and bought the record that day, and since then I've been really into him. We he hired Jon Brion for Late Registration, that was one of my favorite records because I loved Kanye at the time, and Brion is one of my favorite producers. So that album blew my mind; the reality of it is, is that Kanye is really smart. There's no rapper close to making beats like him, and mixing samples with real playing. DT: What I really enjoyed about your latest album, It's a Corporate World, is that the narratives behind the songs showcase your guys' knack for songwriting. Does the melody usually come first and then the lyrics, or do both feed off of each other? Zott: They both feed off of each other. I may have one word for a line of a song, and once I get the rest of the melody, the melody kind of tells you what to say. But then again, there are times when there's something that I've written, but I have to find the right way of phrasing it. DT: I know you guys have performed in Austin many times. What would you say has been one of your more memorable performances here? Zott: We did go to Austin for a week, where we rented a house, and played two Modest Mouse after-shows, two days in a row at Stubb's. We also went to a movie theater and played Jurassic Park, and talked about why we liked the film. I felt like I was able to see Austin for what it really was; that's the best time I've ever had in Austin.